Chinese parts supplier sw-box.com has posted a video and photos of the upcoming the slate-gray enclosure of the upcoming iPad 5.
iPad 5 parts have been floating around for a number of weeks with other videos also showing the new enclosure. This latest video does a good job detailing the physical differences between the iPad 4 and iPad 5. 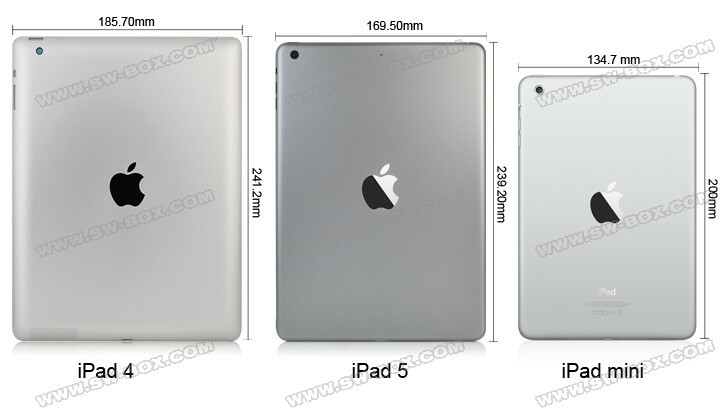 As shown in the video, the iPad 5 will adopt a similar design to the currently shipping iPad mini. The new iPad is expected to debut in October. This is going to be a really lame upgrade. * Faster processor? Big deal, they do that every year anyway. * Super thin side bezels? Major downgrade. I guarantee you there will be issues with accidentally using the touch screen while holding. * Smaller form factor? Who cares, it's not smaller by enough to make it more portable, but it does mean that any previous iPad case won't fit. * Longer battery life? Who cares, nobody should be using their tablet all day anyway. When are they going to add some real specs, like 41MP camera like Nokia has, or NFC like Samsung has, or multitasking, or 128 GB, or some function for the fingerprint sensor (which may not even be included) besides the super rare function of security from intruders? So far there is literally zero reason for any logical person to be interested in this product. It's actually WORSE than the iPad 4. This is what happens when you trade a visionary like Steve Jobs for a beancounter like Tim Cook. I guess they should give up and at this years announcement just say they're not making them anymore. At all. Apple is too slow. New iPad models are urgently needed. If the iPad Mini has a retina display I'll pre-order the damn thing. I'll consider upgrading my iPad 2 when the new iPad has multi-user support. I see TouchID working brilliantly for that. Until then, I can't believe how great and future-proof the iPad 2 was! What is the point? Only a very small percentage uses the iPad to actually make photos. The quality of the current camera is good enough for even that if they use the same one as in the current iPhone. What would you use NFC in an iPad for, and can you tell us/me where I could actually use it? NFC is not really taking off and is likely going to be made obsolete by functionality such as iBeacon, which are much more flexible, consumer centric and cheaper to implement by retailers etc. or some function for the fingerprint sensor (which may not even be included) besides the super rare function of security from intruders? This tech in Apple products is literally less old than a month. Give it some time and it will be used for more purposes. So far there is literally zero reason for any logical person to be interested in this product. It's actually WORSE than the iPad 4. This is what happens when you trade a visionary like Steve Jobs for a beancounter like Tim Cook. What would your vision be? When are they going to add some real specs, like 41MP camera like Nokia has. I really wish people would start to educate themselves just a a little bit more in the photography field. Whoever is responsible for one of the bigest misconception of the century, aka 'High Megapixel = Better pic quality" deserves to be hanged! Actually never mind people, it is absolutely mind boggling when even companies like Nokia don't realise that!! !